Home » Giveaways » Coming Soon: Exciting Events! This N That with Olivia is participating in some pretty awesome events in the next few months! I am really excited to have teamed up with some great bloggers and friends to bring you the best and greatest reviews and giveaways of a variety of products. First, This N That with Olivia will be participating in the Blogorama Bonaza from September 12th-September 22nd! This event will consist a max of 200 blogs coming together to bring you giveaways from sponsoring companies. And each blog will be giving away a prize package worth at least $75! 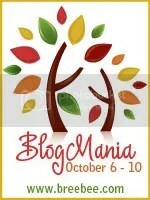 Second, we will be participating in Blogmania ’11 from October 6th-October 10th. In October thousands of dollars and hundreds of items will be up for grabs, you can give some away and win some for yourself! This is THE ultimate blogging event of 2011! Although there is no minimum prize package value, I have a good feeling that most of the participants will meet the $50 suggested prize package value!! Third, This N That with Olivia will be participating in the Fall Fashionista Giveaway Event from October 14th- October 19th! This event is a full out Fashion ONLY Giveaway event, with the plan to host it 2-4 times/year hosted by Still Blonde after all these YEARS, and cohosted by: the Socialite’s Closet and April Decheine.com. AND each blog will be giving away a prize package worth at least $50! Fourth, This N That with Olivia will be participating in the 12 Days of Gifts Galore Hop from November 25th- December 6th! The 12 Days of Gifts Galore Giveaway Hop will be hosted by Tales From the Nursery, Formula Mom, Matter of Cents, and Mama on a Green Mission. And each blog will be giving away a prize package worth at least $25! Fifth, we will be participating in the Holiday Bliss Bash from December 2nd- December 7th! Join Whispered Thoughts & Makobi Scribe for Holiday Bliss Bash 2011. In this event, there are different giveaway categories…. however, all participants will be offering at least a $25 prize package. I am super excited to be a member and participant in each of these events! We are going to have some fun as the holidays draw closer with a lot of GREAT product reviews and giveaways- you don’t want to miss it. If you are a fellow blogger and are interested in getting involved, click either on the buttons or the links in each event for more details. Looks like we’re going to have a GREAT end of the year, what do you think!?!? Go ahead and share This N that with Olivia with all of your friends and get geared up for some wonderful giveaways. I already have a few sponsors lined up, and let me tell you- GREAT products! I am so excited to review!! Thanks for joining me at Create With Joy! I just posted my 2500 GFC giveaway – please, stop by and join the fun!